I’m sure most of you have already heard of Grant Imahara from Mythbusters on the Discovery channel. If you haven’t, please crawl out of the rock you’ve been hiding under for the past several years ;). Did you also know that Grant is heavily involved in robotics and robotic competitions like FIRST? Well… now you do! Anyways, enough intro. We just got word that Robot Magazine is teaming up with Grant Imahara, Revell, Innovation First, Inc. and SolidWorks Corporation for a really exciting competition. So of course we wanted to share this info with everyone here! Revell, Innovation First, Inc., Robot magazine and SolidWorks Corporation, with Grant Imahara, are pleased to announce the	Grant Imahara VEXplorer Robot Challenge. Grant Imahara is one of the hosts of Discovery Channel’s hit television show Mythbusters. He is a special effects expert who has worked on some of the most famous robots in history, such as R2-D2 and The Energizer Bunny, and is the author of Kickin’ Bot, a book that explains how to build your own combat robot. This contest will give 25 robot enthusiasts a chance to compete for a $5,000 scholarship grand prize and various other prizes. *Payable in the form of a 529 Qualified Tuition Plan. 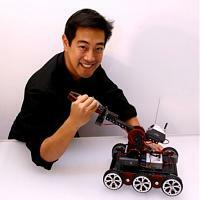 For more information, check out BotMag’s Grant Imahara VEXplorer Robot Challenge page. Interested in getting a VEXplorer or want more info on one? Check out the VEXplorer kit in the TR Catalog.